This feasibility study offered UNIT the opportunity to demonstrate our knowledge of prefabrication techniques and sustainable design credentials. Situated on the west coast of Scotland overlooking the Kyles of Bute, the site afforded amazing views of both the town of Tighnabruaich and the Loch Riddon. The site is steeply sloping with a thin cover of earth above the natural bedrock. Our approach is to touch the ground as lightly as possible avoiding the expense of cutting roads and foundations out of the rock. Roads and houses are designed to sit on the surface. Each unit is made of a prefabricated frame with prefabricated cladding panels and over clad with a limited palette of materials (slate, Cedar and harling). Where buildings or landscaping meets the ground it sits on a base of dry stone walling echoing the local vernacular. Tighnabruaich is a small town build along the edge of Bute Water it is characterised by a mixture of architectural styles from the local stone vernacular bothies and cottages to grander scale whited rendered or harled Victorian villas seen in our site photographs. The strip form of the town is dictated by the steep coastal geography. The town is a popular holiday destination and has historically attracted investment from the second home market. 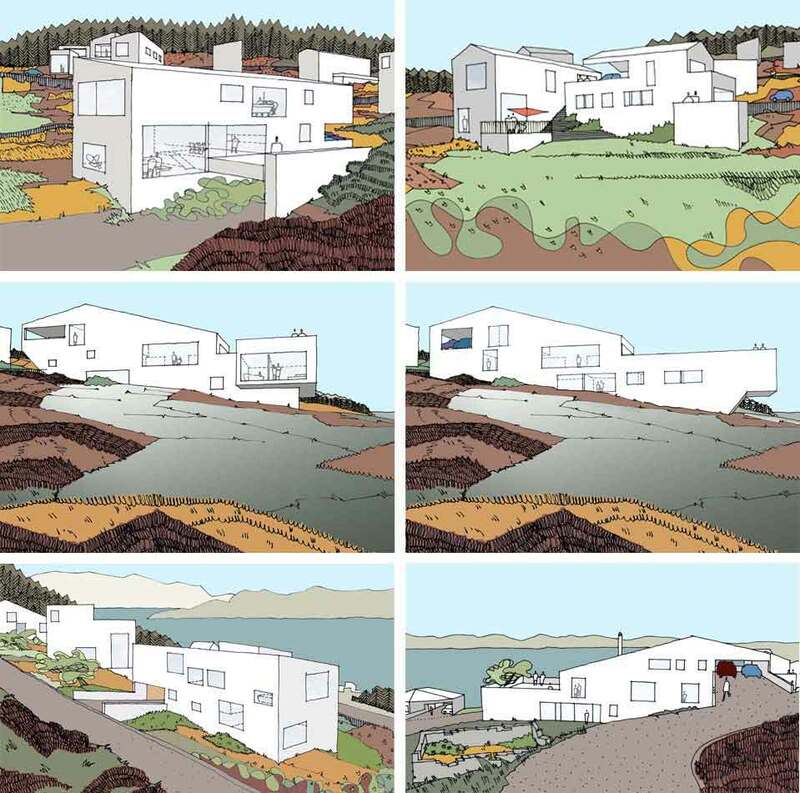 The current site owner is looking to develop 15 highly sustainable luxury villas that can be built in phases. 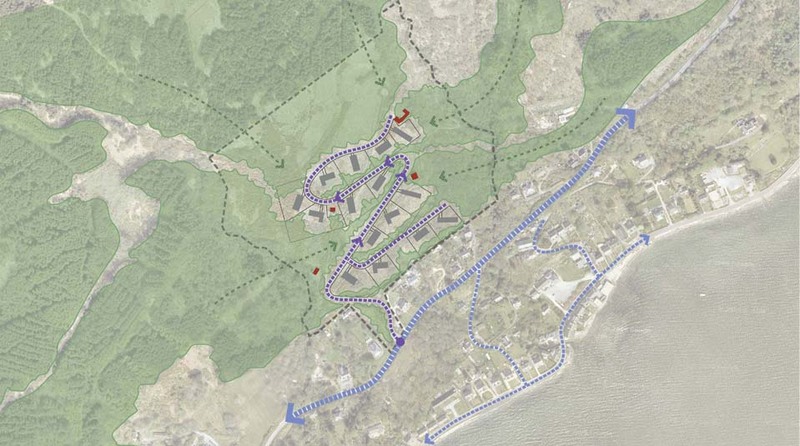 Our site master plan strategy was derived primarily from the access road and hillside geography, but also informed by the accretional development pattern of the existing town rather than the imposed order of pattern book developments seen in so many edge of town expansion plans. Fifteen unique houses were designed using three standard house types. Each house has a unique orientation and site condition, dictating different fenestration requirements with different framed views. A kit of roof types , cladding materials and landscaping is employed to create the fifteen individual units.